On February 7, 2019 Scholastica is taking part in an inaugural event to celebrate and facilitate academic-led publishing. Get the details below! 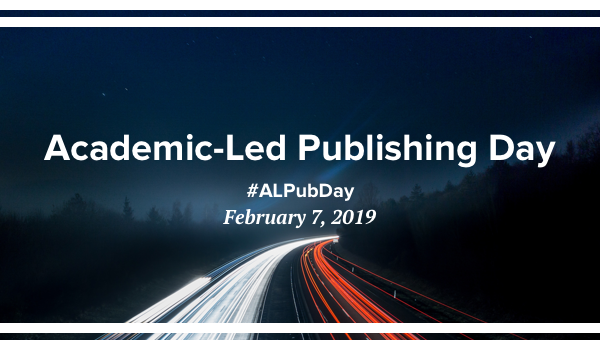 For more event updates be sure to visit the Academic-Led Publishing Day website and follow announcements on Twitter with the hashtag #ALPubDay! What does it mean for a scholarly publication to be academic-led? And why does academy ownership of research matter? We’ll be focused on these questions and more along with ways to get involved in academic-led publishing initiatives during the first Academic-Led Publishing Day on February 7, 2019. Academic-Led Publishing Day is a global digital event to highlight and foster discussions about how members of the scholarly community can develop and support academic-led publishing initiatives. The event will bring together various stakeholders in the future of scholarly publishing. Similar to Open Access Week, Peer Review Week, or Day of Digital Humanities, ALPD will be a community-run event with no official “owner” or “host organization.” Rather, it is an independent initiative that all participants are “co-hosting” and co-promoting via a shared event website and their own channels. To see a list of all ALPD participants and scheduled events and resources, as well as to learn how to get involved, visit the official website! What is academic-led publishing and what will be the focus of Academic-Led Publishing Day? Academic-led publishing refers to scholarly publishing initiatives wherein one or more academic organizations control decisions pertaining to copyright, distribution, and publishing infrastructure. The goal of Academic-Led Publishing Day is to create an open dialogue about academic-led publishing programs and funding models—both current and potential—and to raise awareness about the roles and capabilities of different stakeholders in this space. The day will consist of virtual and in-person events, social media discussions, and a collection of blog posts and relevant resources listed on the event website. Follow #ALPubDay on Twitter and Facebook for event updates and announcements! Is OA publishing alone enough to make research equitable? This was a core question posed during Open Access Week 2018 and one that we at Scholastica will be focusing on this Academic-Led Publishing Day. In the traditional journal publishing system, in which corporate publishers control over 50% of the scholarly literature with profit margins in excess of 30%, journal subscription prices have skyrocketed to exorbitant levels that many institutions and scholars cannot afford. Open access presents a solution to the problem of scholars and individuals not being able to access vital research, but at what cost? There are mounting concerns that if corporate publishers remain in control of the majority of research they will dominate how open systems are devised and use article processing charges (APCs) to maintain their high revenue streams. With APCs rising upwards of 6% in the past few years, many scholars and institutions are already struggling to come up with the funds needed to publish in leading journals. Should APCs continue increasing, OA publishing fees extracted from the academic community could soon rival the cost of serials. In this way, open access could perpetuate and even exacerbate inequities in academic publishing, resulting in academic institutions continuing to struggle to keep up with journal costs and many scholars being underrepresented or left out of the research literature. As a result, many argue that more academic-led publishing initiatives are needed to counter the imbalance of power over journals and challenge inequitable publishing practices. Anyone is welcome to participate in Academic-Led Publishing Day. To take part in the day, look for announcements on the official event website and follow event discussions on social media via the hashtag #ALPubDay. If you work with an organization that would like to submit a blog post, online resource, or digital or in-person event related to academic-led publishing to be included on the shared event website, you can sign on as a participating organization by filling out this Google form.